I’ve heard people say that, since Obamacare passed, the cost of their “health care” went up. So much for it being affordable, right? What did they mean by this exactly? Well, after probing a bit, I almost inevitably find out that people are talking about their health insurance premiums increasing. And certainly that has happened for a considerable number of people. But, let’s remember what this law is officially called: The Patient Protection and Affordable Care Act (PPACA). It’s not called the Cheap Health Insurance Premiums Act. And that distinction is tremendously important. Health insurance is not health care. People who are uninsured still get health care, after all. Health insurance is merely a mechanism to pay for health care. Although health insurance in the USA is far from comprehensive today, consider the health care expenses that insurers could avoid paying (or carve out expensive riders and separate risk pools with higher premiums) for before Obamacare. Health care for pre-existing conditions without prior creditable coverage. If you lost your job and spent a period of time unemployed, your new employer’s policy could deny claims for pre-existing conditions for the first 12 months of your policy. And even if you had prior creditable coverage from an employer, with pre-existing conditions you could have been denied insurance in the individual market until you first exhausted your pricey COBRA benefits for 18 months. (I learned this one firsthand.) People who were uninsurable were sometimes transitioned to state high-risk pools, although the premiums in these high-risk pools were typically much higher than premiums in the rest of the individual market because those high-risk pools were not generously funded. OB/Gyn services, including maternity. In the individual market, many policies excluded maternity services entirely and, even if you paid for a separate maternity rider, it had a waiting period on it to prevent people from signing up just after learning about a pregnancy. Because OB/Gyn services can be expensive, women of childbearing age were often charged higher premiums than men of the same age and health status. Health expenses exceeding annual or lifetime maximums. If you had too many physical therapy visits in a calendar year, regardless of medical necessity, you were out of luck. Likewise, if your care became too expensive — either within one calendar year or over your lifetime — you were also out of luck. The PPACA also requires all health insurance policies to cover preventive care with no out-of-pocket costs. With community rating rules, there is no more medical underwriting…so a sick person pays the same premium as a healthy person. You shouldn’t go broke just because you get sick. Insurance is supposed to insulate us from expenses that can decimate us financially. Yet, as the study above shows, health insurance hasn’t done a particularly good job of that for Americans. As expensive as health insurance premiums could be before Obamacare, they were often artificially low because they were written to limit the insurer’s exposure to expensive claims for health care…putting those expenses right back on the patient to pay out of pocket. The PPACA mitigated this to some extent, particularly for the sickest of the sick, but a consequence of that was an increase in unsubsidized premiums and/or (as a tradeoff) an increase in deductibles. Community rating effect on premiums. Suppose an insurer has to cover 10 subscribers and expects to incur claims totaling $5,600 per month for all of them. Assuming that the insurer is operating on an 80 percent medical loss ratio, the insurer would need to collect $7,000 in total premiums each month from the group. 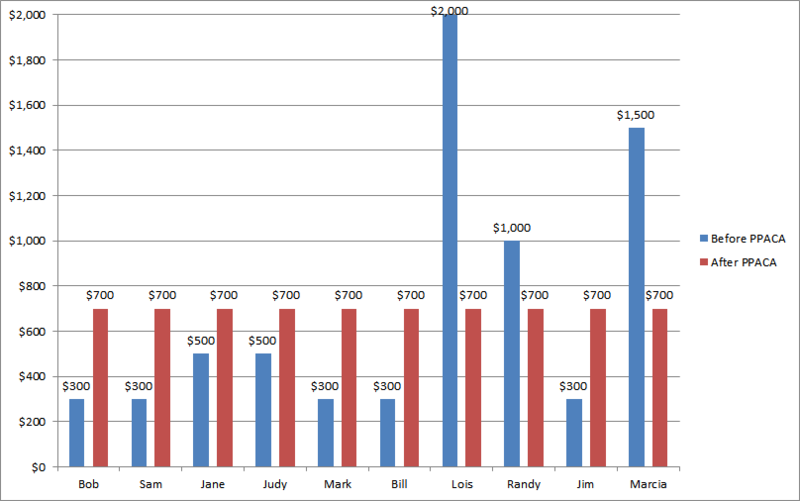 Before the PPACA, the sickest members of the group (Lois, Marcia and Randy) paid much higher premiums than the others. But the PPACA’s community rating rules took away all medical underwriting, forcing insurers to charge everyone in the group the same premium, regardless of health status. That increased premiums for the healthier members of the pool but also decreased premiums for the sicker members of the pool who needed more health care. Note: This chart is a gross oversimplification to illustrate the principle of community rating. It does not account for people who could not get into the pool at all before the PPACA, income-based subsidies, or out-of-pocket expenses not covered by insurance. It also assumes the insurer was operating at an 80 percent medical loss ratio even before being required to by the PPACA. The problems in the health insurance market are merely symptoms of a far more complex problem: the high cost of health care in the United States. The PPACA merely took some of the tools insurers were using to avoid paying for that health care and to attract healthier subscribers (at the expense of sicker ones) out of their toolbox. And it’s the people who need health care the most — the “patient” that the act was designed to provide “protection” for — who benefited the most even though the healthier people who needed health insurance just in case took a hit. As a financing mechanism, insurance is about spreading risk, and the PPACA made sure that the risk was spread more broadly.